What’s better than mixing the Easter Bunny with a horde of the Easter egg-crazed undead? 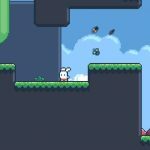 If you said nothing, congratulations, we’ve got an app for you — Bunny the Zombie Slayer, today’s leading game and a fun exercise in anti-zombie, egg-flinging physics. 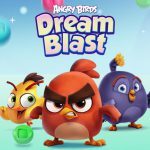 You can read all about it on today’s Fresh Games list below, along with a quality match-three title in Burning Birds, and an update to the addictive battle-driving game Death Rally. Just in time for Easter festivities comes Bunny the Zombie Slayer, a game that mixes the Easter bunny, egg hunts, physics-based action and zombies into one awesome package. As the Easter Bunny, you have to protect some oblivious, egg-hunting kids from their zombified families, friends and neighbors. From behind your sandbag fortifications, you lob your magic Easter eggs at the incoming zombie horde, trying to take them out as quickly and efficiently as possible. As always, headshots are the best way. In a setup a lot like Plants vs. Zombies, you’ll play defense from the left side of the screen while zombies come toward you from the right. Touching on the screen lets you aim the arc of your thrown eggs, but you’ll have to think carefully because your angles are limited. If you get into trouble, you can use a special egg that clears the screen, but you only have a limited number of these; multiple headshots in a row earns you more, so accuracy is key to long-term survival. 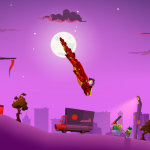 The bottom half of Burning Birds is a lot like Tetris. There are piles of eggs below a bird sitting on a power line, and if you tap the bird when a thought balloon appears above its head, it’ll lay another egg. Three in a row of the same color clears the eggs from the screen, and each group of eggs goes toward clearing the level. The trick is clearing groups of eggs that also include coins, which increase your score for the stage. But the match-three aspect is only part of the game: Sometimes power surges will come along the power line that you’ll need to dodge by tapping your bird. And as the game goes on, you’ll get more and more birds under your control, each with different eggs and each needing protection from the surges. The more birds you can keep alive, the more points you’ll pull down, but lose them all and it’s game over. Remedy Entertainment is making Death Rally a better and better deal all the time. Before, this racing battle game that encouraged you to blow up your opponents as much as out-race them carried a lot of goodness — a bunch of tracks, five cars and several weapons. 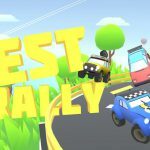 In a previous update, Death Rally added another car and new weapons to its roster of implements of destruction. This time around, Remedy has packed in more events to take advantage of the varied gameplay that comes with new weapons. Last time, it added levels where nitro boosts were the only power-up on a track, causing quite a lot of mayhem among the racers. This time, challenges are weapons-specific, putting gatling guns, sniper rifles and more in the hands of everyone on the track. Remedy has also fixed a lot of bugs and added left-handed controls.